Welcome to a shiny new year and our first issue of 2016! 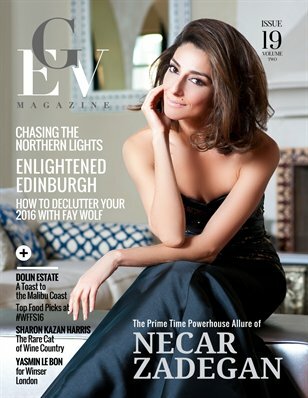 Fiercely fabulous, actress Necar Zadegan graces our cover and gives us a peek into her life as one of the radiant stars of Bravo’s hit series Girlfriends’ Guide to Divorce. Fresh off our commitment to brilliant New Year’s resolutions, we glean a number of tips for effective decluttering from LA’s most in-demand professional organizer, Fay Wolf. Tipping our hat to the winter chill settled across most of the hemisphere, we visit the bright northern locales of Edinburgh, Scotland and the upper reaches of Swedish Lappland. Our main fashion editorial features affordable luxury from Winser London and illuminates the eternal incandescence of model Yasmin Le Bon. In the world of wine, we raise our glass to two trailblazing stars from California: Sharon Kazan Harris of Rarecat Wines and Elliott Dolin of Dolin Estates. Here’s to another year filled with possibilities! Once again let’s give it up for the whole team of Gastronomique En Vogue who is responsible for presenting you all another stunning issue!